Fundulopanchax sjoestedti, otherwise known as the blue gularis, is part of the American Killifish Association's logo and one of the best known killifish in the hobby. It is large, colorful, and not particularly shy. The fish's most distinctive mark(but not present in all fish) is the 3 forked tail. In some fishes almost nonexistent, and others sport long streamers from the tail. The fish is so markedly patterned and colored it is hard to describe but the picture above is adequate representation. The male I have has a blue back, orangey flanks maarked with dark reddish brown stripes. The sides are a purplish color overlayed with white spots. The head has lots of these white spots and also red markings. The three pronged tail is a icy white blue with black striations and spots. In the centre their is a section outlined in black that is a fiery poppy orange which is framed nicely by the other colors. Dorsal fin has a similar pattern to the caudal fin. The large pectoral are spotted with brown and have attractive white trimmed edges which are very noticeable as the pectoral fins are always in motion. However, the color varies considerably between fish and strains. Unfortunately the female sports little of the color that the male has and is no match for her gaudy mate. She is drab mouse-grey and the only markings she has is faint black spots on her median fins, stripes, and faint reddish spots and the bars behind the eye of the male. Blue gularis are for the most part easy to please. They accept a wide range of water conditions and if the water quality feed and other enviromental factors are good should thrive. They seldom take prepared foods, and if so without enthusiasm. They will, however, take frozen and live foods. My pair loves frozen bloodworms, blackworms, and a particular favorite chopped redworms. They should take pretty much anything of this sort. I'm in the proccess of setting up a worm bin to grow these worms to satisfy their appetites. They are greedy but care must be taken not to allow them to gorge as this can cause health problems. Also, unless you don't mind them dissapearing do not house these killifish with small fish such as guppies as they will be stalked and eaten. Larger fish may occasionally be nipped but nothing too serious should happen. Despite the fact they occasionally pick on tankmates they should not be kept with other aggresive fish. In fact, they do best by themselves. A breeding pair can be kept in a ten gallon providing you keep them seperate by a divider. Even in large tanks it is best to keep the male and female seperate as the male is an aggresive driver. 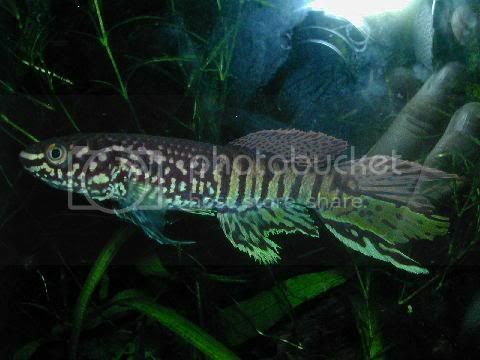 Blue gularis are simple to breed, but it is difficult to get fry. The largest obstacle(which I haven't been able to overcome yet) for many is infertile and fungusing eggs. Young pairs tend to give infertile eggs and some say that fertility is best in soft water and when kept warm at around 75 degrees. Their are as many ways of handling these eggs as their are people who keep them. Some find that keeping the eggs in water gives the best results, and may add methylene blue or do other special things to try to ensure the eggs hatch. Others after leaving the eggs in the water for a few days and discarding white eggs put the eggs ontop of or in moist peat to incubate for around 6 weeks. Fry are reported easy to raise on a diet of baby brine shrimp and larger foods as they grow. I have bred my pair but have yet to get fertile eggs from them. Edit: Unless anyone else has anything to add I think this one is done. Hi noname, nice article, beautiful fish! Just one point, isn't this fish of the family Aplocheilidae rather than Cichlidae? It is my understanding that killifishes are of the order Cyprinodontiformes (toothcarps) which includes rivulines, killifishes and live bearers, and these are in the family Aplocheilidae rather than Cichlidae. Nice catch Haname! I was lazy so copied the format from Cyradia's Tilapia submission which allowed me to leave a lot of stuff the same . Unless anyone thinks differently I think this is done.